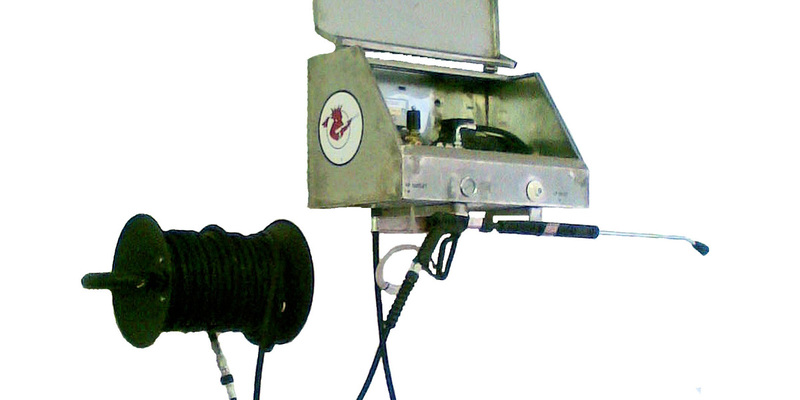 The Storm Wall Mounted 1 is a powerful 230V pressure washer giving 1500psi of cleaning pressure. The wall mounted machines come with a drilling template for ease of fitting. Just drill two 14mm holes to accept an M10 rawbolt – that is all that is needed. The machine can be installed and working within minutes, simply drill and fix then plug into a suitable electricity supply and connect your water supply. 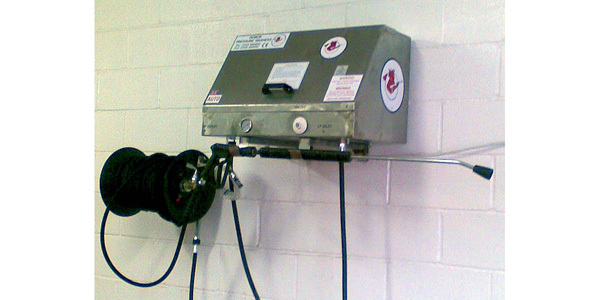 The wall mounted range come with 9 metres of high pressure hose as standard and chemical pickup. The quick release lance supplied enables effortless change-over between lances and brushes or any other accessory in the range. The Storm Wallmounted now comes with a built in water tank which complies with water authority regulations. The hose reel pictured is available as an extra along with hose upgrades. It does not come as standard. The Storm Wall Mounted 4 is a powerful 415V pressure washer. The wall mounted machines come with a drilling template for ease of fitting. Just drill two 14mm holes to accept an M10 rawbolt – that is all that is needed. The machine can be installed and working within minutes, simply drill and fix then plug into a suitable electricity supply and connect your water supply.